Tropical plants add an exotic touch to summer gardens and make excellent indoor houseplants as well. During the summer, place outside in a warm, shady location. Keep well watered and fertilize regularly. In the early Fall, bring indoors to overwinter. Make sure to treat with Bonide® Systemic Granules Insect Control 1 week before bringing inside to eliminate unwanted insects in the house. Easy to care for, Phalaenopsis Orchids are popular for their exquisite elegance. The long-lasting flowers will bloom for up to three months. Light: Phalaenopsis like the indirect sunlight indoors. Avoid too much exposure to the sun as that can cause the leaves to burn. Water: Water once a week to keep continuous moisture just below the surface of the medium. Be careful to not over water and make sure that the plant does not sit directly in water. 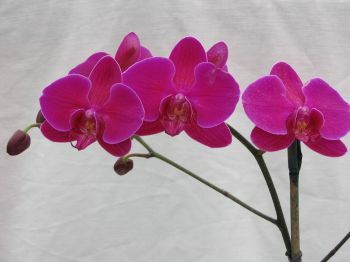 Feeding: Feed the Phalaenopsis every two weeks during the active growing season (April – September) with Ed’s Exclusive Bloomer Boomer fertilizer. Use 1 teaspoon per gallon of water to make sure that you don’t overdo it. During the rest of the year, fertilizing once a month is sufficient. Note: When the last flower drops, cut your flower spike halfway down the stem. Continue caring for it and wait for a possible rebloom. With exotic foliage and blooms, Guzmanias add warmth to any office or home. Light: Guzmanias like bright light, so best to place in windows facing east or west. Water: Water once a week. Be careful to not over water and make sure that the roots are not sitting in water. Feeding: Fertilize the Guzmania every two weeks during the active growing season (April – September) with Ed’s Exclusive Bloomer Boomer fertilizer. Use 1 teaspoon per gallon of water to make sure that you don’t overdo it. During the rest of the year, fertilizing once a month is sufficient. Note: When the blooms stop, cut the flower spike down to the base. Wait for new shoots to emerge at the base of the plant. 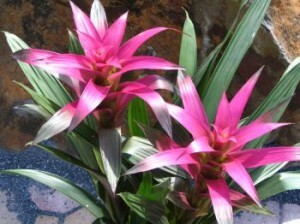 The new shoots can be cut or dug up and re-potted to produce a new full-sized bromeliad! Mandevilla are popular for their heat tolerance and eye-catching blooms. 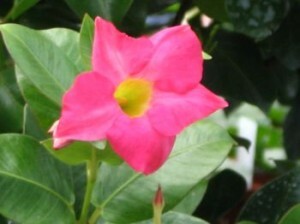 Light: Mandevilla like bright indirect sunlight indoors. Outside, grow mandevillas in partial shade. Water: Water daily if grown outside. Feeding: Fertilize the Mandevilla every two weeks during the active growing season (April – September) with Ed’s Exclusive Bloomer Boomer fertilizer. Use 1 tablespoon per gallon of water. During the rest of the year, fertilizing once a month is sufficient. Note: Move indoors for the winter and reduce frequency of watering. Use an insecticidal soap to remove any unwanted pests if placed outdoors. Prune back in late winter or early spring before new growth begins.